God will not forgive me if I keep quiet while my people suffer, says Melaye – Royal Times of Nigeria. Dino Melaye, senator representing Kogi west, says he will not be forgiven by God if he stays mute while his people suffer. The senator on Saturday cautioned politicians against “politics of hatred and bitterness that was gradually gaining ground in Kogi especially in the past two years”. While addressing hundreds of women who protested the alleged attempt on his life, he noted that although political rivalry was normal, it should not be allowed to degenerate to assassination and violent attacks. About 10 gunmen had reportedly invaded his Kogi residence on April 15 and opened fire on the house. 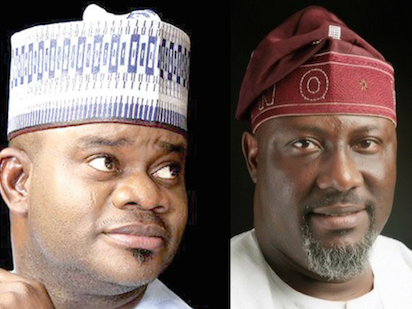 Melaye was at home for the Easter holidays but he escaped unhurt. The senator assured the women that he will “sustain” his fight against injustice and delays in the payment of salaries and declared that attacks and intimidation would not deter him. “God will not forgive me if I keep quiet while my people suffer”, he said. The women, who marched through the street leading to Melaye’s house in Ijumu local government area of the state, came from the seven LGAs that make up the senator’s district. They were seen with leaves and placards, some of which read “touch Dino and face our wrath”, “don’t kill Dino Melaye” and “don’t kill the light, let it shine”. Speaking to journalists, one of their leaders, Ikusemoro Jalo, said that the solidarity protest was to affirm their support for the senator as well as “condemn the recent attempt on his life”. “We are mothers; we don’t want him to be murdered. He is representing us the way we want. We are proud of him because he has made us proud,” she said. She advised the senator “not to be cowed by the recent attempt on his life” but to continue “to fight for the rights of women, workers, pensioners, the oppressed and the repressed”. Titi Kayode, another speaker, said that assassination had never been part of politics in Okunland. She described those behind the attempt on the senator’s life as “enemies of peace and progress”. Kayode also called for a quick release of the report of the ongoing investigation into the incident “so that its perpetrators would be brought to justice”. Responding, Melaye expressed gratitude to the women for their support and prayers. He said he “narrowly escaped death” on the day of the incident.